​​Look and listen! God is always creating us anew, offering new perspectives for living as faithful disciples. Look and listen...as new possibilities are given to us, let us walk hand in hand with holy truth. Be glad and rejoice, for God is creating us ever new...​We will sing and shout with hope and joy, for God is with us here. Hymn TIS 687: “God gives us a future” We become stuck in habits that are not at all helpful or productive. God throws open new possibilities for us to do his will, even when we have not followed that true path before. Grasp those opportunities and leave the old ways. John prayed for forgiveness for all of us. These times are so precious. Left on our own, our confessions can be half- hearted and we neglect to ask God for the strengths we need to follow God's command. But in this communal prayer, we are led to address all the issues that we need to hold up to God. Amen. Look! God is creating a new heaven and a new earth. Past events aren’t remembered; they don’t even come to mind. In Christ Jesus, we’re forgiven and made new. As people of peace, let us share words of grace and gestures of love, as we pass the peace of Christ together. We thank you, God, for being our strength and shield, our salvation and our hope. As we have drawn joy from the springs of your salvation, may these gifts become springs of hope to a world thirsty with need...Amen. Hymn TIS 52: “Let us sing to the God of salvation”​​​ Praise God for every blessing. Yes! More than a few of life’s unsettling situations have both problem and opportunity wrapped up inside them. 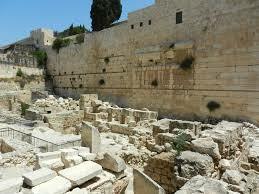 John told us about a time at the end of Jesus' ministry when he heard people admiring the temple. Jesus warned: “All this beauty, every dressed stone you see, every ornate appointment in this place will one day soon be nothing but rubble!” Jesus described what would happen but that was not his focus. John explained: 'Rather, he turns the conversation from what will happen in the future to how those who confess him as Lord must live their lives in the face of difficulties that could become opportunities." We don't like anything to be difficult, even opportunities. John continued: 'To embrace our Jesus’ values, to love our enemies, to speak peace in the presence of war, to offer reconciliation in the midst of division always requires courage." He pointed out that: "The first choice we make is whether we will live the faith we confess." John had much more to say but we are smart enough to apply the above words to our lives.....if we dare. Hymn TIS 186: “Stars and planets flung in orbit” These would be my words if I had thought of them. This universe is overflowing with the signs of God's marvelous creative gifts. Intercessory Prayers​ We prayed for ourselves and those around us and then joined in The Lord's Prayer. Hymn TIS 473: “Community of Christ”. We are the church, Christ's hands in this world. Think of everything that Jesus would want to do to right this planet. To repair the environmental damage; to heal all the sick; to comfort those upon whom hostilities are thrust by others. Comfort all his people. ​Behold, you are a new creation in Christ Jesus! We rejoice and are glad, for God is making everything new! Look! The ​world needs this hope! Go forth to proclaim God’s new creation, as we live in peace and grow in love in the name ​of our God, creator, redeemer and giver of life. Hymn TIS 778: “Shalom to you” This is the most precious gift you can offer to another person. The congregation processed into the church; a cloud of witnesses; a line of saints who have served at Marsden Road Uniting Church and out in the world for so many years out of their love for God and their love for their fellow people. Hymn TIS 455 verses 1, 2, 3, 7 & 8: “For All the Saints” May we continue as the saints of old who in God's strength and guided by his Spirit, laid the foundations of this church to which we belong and in which we serve. ​Praise the Lord! Sing to the Lord a new song! Love your enemies, do good to those who hate you, bless those who curse you, pray for those who abuse you. If anyone strikes you on the cheek, offer the other also; And from anyone who takes away your coat do not withhold even your shirt. Give to everyone who begs from you; and if anyone takes away your goods, do not ask for them again. Do to others as you would have them do to you. Praise the Lord! Sing to the Lord a new song. ​Take courage, all you people. ​Take courage, says the Holy One, for I am with you. ​Do not be afraid, for God’s Spirit is with us. ​The Holy One watches over all who come in love. ​Let our mouths speak the praise of God. ​Let us bless God’s holy name forever and ever. Hymn TIS 454: “Worship the Lord in the beauty of holiness” We can approach God in confidence, knowing that he will lighten each burden and guide our way. Almighty God, your people of all the ages live and praise you without ceasing. In our communion with you, we have communion with generations past and generations yet unborn. Before your throne we are one with a great multitude which no one could number, and in praising you we join with people from every nation. Grant to your church on earth that as we celebrate the triumph of your saints in glory we may profit by their example and enter with them into the inexpressible joys you have prepared for those who love you, through Jesus Christ our Lord. Amen. 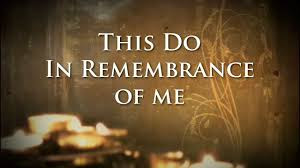 A time when we are given an opportunity to think about all our blessings and God's great generosity to us and then think about and acknowledge all the ways in which we fail to live out the freedom he has given us. Then we can lay that burden of failure on him and ask forgiveness. Hear again, the word of truth: in Jesus Christ, we are forgiven. As forgiven and loved members of Christ’s body, let us share signs of peace with one another. The peace of Christ be with you. The Peace of Christ be with you always. Living, loving, gracious God, in you we find eternal life. Accept these gifts, that we may spread the good news of your comfort and grace throughout the world. Amen. Hymn TIS 511: “Let us break bread together with the Lord” "Lord, fill all our living with your life." The only way we can live authentically. ​Lift up your hearts. We lift them to the Lord. ​Let us give thanks to the Lord our God. ​It is right to give our thanks and praise. through many trials: Abraham and Sarah, Miriam and Moses...Martin Luther King Jr. and Mother Teresa— all attest to your providence and mercy and show us ways to live. Holy, holy, holy Lord, God of power and might, Heaven and earth are full of your glory. Hosanna in the highest! Blessed is the one who comes in the name of the Lord. Hosanna in the highest! Blessing and glory and wisdom, thanksgiving and honour, power and might be to our God forever and ever! Amen. ​Jesus, Lamb of God, have mercy on us. ​Jesus, bearer of our sins, have mercy on us. ​Jesus, redeemer of the world, grant us peace. Ephesians 1:11-23 You who have heard and believed, you are his. Luke 6:20-31 This is about ignoring the ups and downs of this world and other people and remembering whose we are. Thanks be to God. Today I am making a huge exception. For the first time since I began writing this blog, I am sacrificing the space given to the sermon to relate the blessings received from other parts of the service. Hymn TIS 256: “From heaven you came, helpless babe” This hymn paints a picture of an unexceptional person, who in obedience to God, provided us with a way back to wholeness. However this wholeness can only be as intended if it is spent in service. As Grahame played we prepared ourselves to hear God's voice and to let our imagination see God's intended will in action. 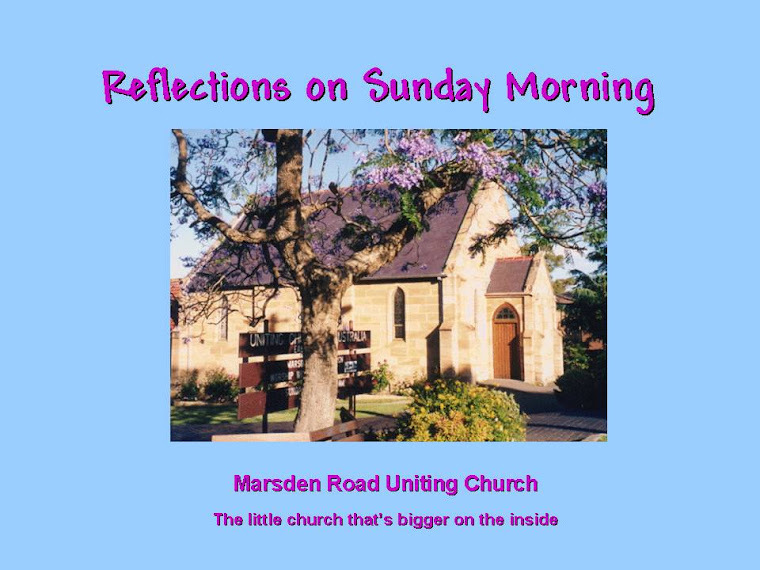 This is the time when we look outwards, focusing on the world around us, from our own church to our local suburb to our state and country, praying for our secular, business and political leadership. Praying for all those in distress of any sort, anywhere in the world, especially those who have given up hope as the result of terrible physical or mental illness or because of irreparable damage to their homes brought about by hostilities often way outside their own influence. ​God of truth, for all the saints. We give you thanks. Then we prayed together The Lord's Prayer. Hymn TIS 456 "Your hand, O God, has guided” An affirmation that God always has been and always will be with his people. ​​​In all things, give thanks to God, for you have been called to bear witness to the good news. And may the Creator of all, Holy Spirit, and Christ Jesus— one God, living in you and through you and around you, comfort your hearts and strengthen them in every good work and deed. Amen. May the feet of God walk with you and his hand hold you tight. May the eye of God rest on you and his ear hear your cry. May the smile of God be for you and his breathe give you life. May the Child of God grow in you and his love bring you home. The congregation then forwarded out and gathered around the church garden while John conducted a service to scatter Tom Lowe's ashes onto the ground of what had been his spiritual home for so long. His Spirit will remain with us. To the church of Marsden Road Carlingford, which is in God, our Mother and Father, and in the Lord Jesus Christ, grace and peace to all of you! Greetings to you in the name of God. Greetings to you! Greetings to you in the name of Christ Jesus and the Holy Spirit. Greetings to one and all! God gives us everything we need. Thanks be to God! Our God makes us everything we are to be. Let us offer thanks to the Holy Three-in-One! Hymn TIS 560: “All my hope on God is founded” At that is the only sure place. Dear God, it is so easy to get discouraged by the news in our community, across our country, and around the globe. Everywhere we look, we hear of violence, conflict, and injustice. Like the prophets of old, we want to cry out: “Hurry up and change the world, God!” And then we look at our own lives and realize you are calling us to hurry up and change the world. As we encounter Christ in our worship this hour, may our life be transformed; may we leave this place eager to share your blessings, your justice, and your love with a world yearning for a new way of living. Amen. The bulletin tells us it’s time for the Prayer of Confession, but is that necessary here in this church? We are not Zacchaeus. We don’t cheat others. What do we have to confess? God, we live in a world where our systems, corporations, and institutions oppress others. Forgive us when we keep silent. We don’t perpetrate violence against others. We are a community of love. What do we have to confess? God, we live in a broken world that practices violence in response to conflict. Forgive us when we keep silent. We are a community of good people who worship Christ and show love and mercy. What do we have to confess? God, each and every week, we show ourselves to be imperfect human beings, — we miss opportunities to say thank you; we take others for granted; we omit the whole truth in conversations; we snap at family and loved ones; we participate in gossip; we neglect to express gratitude to you for your many blessings. Forgive us when we accept our shortcomings and fail to come to you for help. Salvation came to Zacchaeus, a cheater and a thief. Today, salvation comes to us in the person of Jesus Christ, who forgives us and sets us free, that we may be transformed in holy love. God of amazing grace, you have given us everything, including our very lives. Though we cannot earn your love, you give it to us freely. And so we thank you and ask you to receive our gifts. Hymn TIS 650: “Brother, Sister let me serve you” It takes more than a little humility to say these words but through grace , we can. Habakkuk 1: 1-4; 2: 1-4 This is a lament. A protest to God about how things are and why he doesn't change them, I think many of us are feeling that way now when we see the news and read the newspapers. But God assures us that he will prevail and if we look about us the world is full of people whose actions show that happening among us now. 2 Thessalonians 1: 1-4. 11-12 I don't know if this link was intended but there is the Church fulfilling the wishes of those who sent up the lament in Habakkuk. 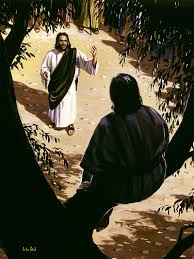 Luke 19: 1-10 We all know the story of Zacchaeus who was called down from his perch in a tree to take Jesus home for a meal and whose life was turned upside down in the process. That's what God promises us who lament that goodness seems to have left the world. His action through changed lives can change the world. For the Word of the Lord. Thanks be to God. John spoke about the democratic nature of death. This was one sermon that we couldn't brush off as applying to someone else but not to us. We all will die but we are promised that Jesus will shepherd us through that time and because he experienced death on the Cross and overcame it, we can be assured that we will be guided safely through it. So our journey to and through death can be one of hope. Jesus has experienced death and understands our fears but because he offers us new life and one that offers more than we can ever imagine, we can trust in his care. "Gentle Shepherd, lead us from our pain to a sense of peace, and help us to trust you even when our eyes are filled with tears. Death submerges us in anguish and confusion. Yet in the midst of our dark valley you are there. Deliver us from our turmoil and help us to rely on your strength during our times of loss and in our fears of death. This we pray through the Father, Son and Holy Spirit." Amen. Hymn TIS 209: “And can it be” It always amazes me that this freedom became mine. Jesus, Saviour of the lost, hear the prayers we bring for the world and for the Church, that your people who are lost in worlds of poverty, greed or exploitation may see you and know your salvation. We pray for your worldwide church, for all who accept you as their Saviour; for all who seek to see and know you; for those whose longings the church has failed to satisfy; those whom the church has driven away from you. We pray that people who are lost in shame and condemnation may see you and know your salvation. Come into our hearts and homes this day, that your people who are lost in lives without meaning or hope may see you and know your salvation. After this we joined in the Lord's Prayer. Hymn TIS 495: “Father, we give you thanks, who planted...” An extraordinary act of generosity. In the name of God, our Mother and Father, who gives us everything we need . . . In the name of Christ Jesus, our Master, whose love transforms us . . . In the name of the Holy Spirit, whose power strengthens our faith and increases our love . . . Let us go in peace. Let us go with God. Let us go to transform the world. Amen. Hymn TIS 780: May Light Come into your eyes, may hope spring up in your heart, may peace guide all of your mind and keep you in God. Amen.